Extremely popular truck for storing or transporting valuable materials. 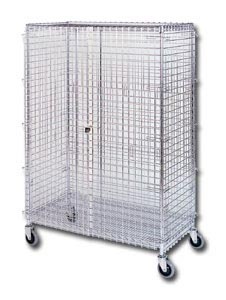 Chromate construction features 2 x 2" wire mesh on all sides for complete visibility. Front doors have lockable handle (padlock not included). Ideal for securing UPS packages, tools, liquors, drugs, etc. Optional shelves may be added to suit your needs. 5" polyurethane casters for easy mobility. 1200 lb. capacity. Shipped KD. FOB Shipping Point. Turn your wire cart into the ultimate handling machine. Allows the user 4 swivel casters for easy maneuverability in tight areas or rigids and swivels for better handling and tracking. Smart Karts are equipped with 2-swivel, 2-Smart casters. Smart casters convert from swivel to rigid with the touch of the toe -- lock from swivel to rigid in any 4 positions. Like having a cart with 4-wheel drive. All carts are equipped with 5" polyurethane casters for 1200 lb. capacity. Shipped KD. FOB Shipping Point.